A little-known holiday gem by Eddy Arnold. 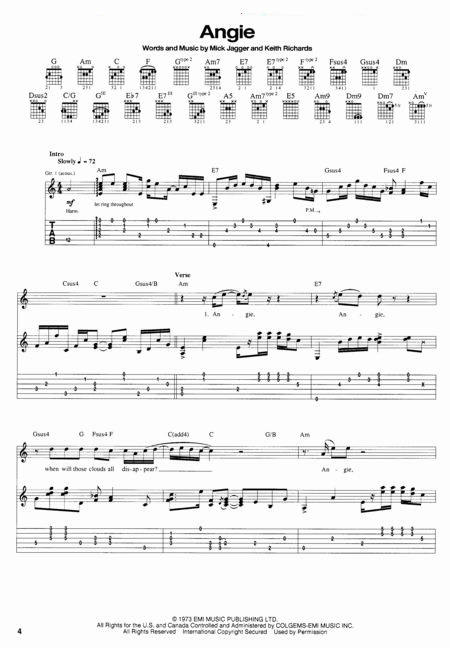 This arrangement is written with the young beginner in mind. 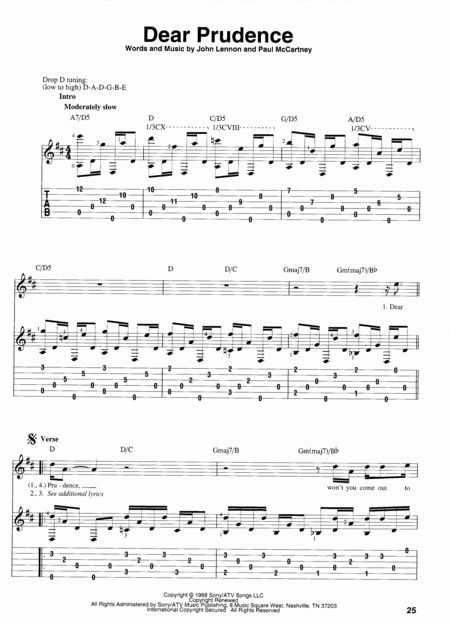 Early Elementary HLSPL Level 1; student part with teacher accompaniment 4/4/ meter; Single-line melody throughout with large note values. Stationary hand position;. Lyrics included. Bring a bit of nostalgic swing to the holidays with this classic Christmas tune! 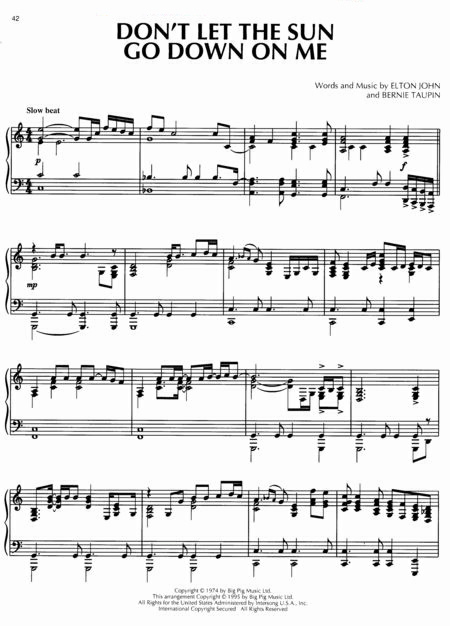 Late Elementary (HLSPL Level 3); piano solo with teacher accompaniment; 3/4 meter; C Major; simple notation; mainly 5-finger positions with some hand-position shifts and expansion to a 6th. Lyrics included. 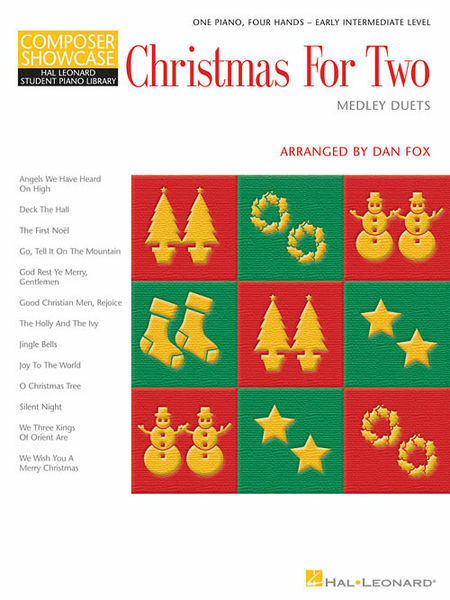 Includes 11 intermediate-level duets arranged for one piano/four hands: Caroling, Caroling · Do You Hear What I Hear · Happy Holiday · Happy Xmas (War Is Over) · I Heard the Bells on Christmas Day · I Saw Mommy Kissing Santa Claus · I'll Be Home for Christmas · Last Christmas · Let It Snow! Let It Snow! Let It Snow! · White Christmas · Wonderful Christmastime. This great series comes with a CD that features separate tracks for the Primo and Secondo parts – perfect for practice and performance! 9 holiday favorites, including: Angels We Have Heard on High • Ding Dong! Merrily on High! • The First Noel • God Rest Ye Merry, Gentlemen • Hark! the Herald Angels Sing • It Came upon the Midnight Clear • O Come, All Ye Faithful (Adeste Fideles) • O Little Town of Bethlehem • What Child Is This? Angels We Have Heard On High - Hark! The Herald Angels Sing - It Came Upon A Midnight Clear - Jingle Bells - O Come, All Ye Faithful (Adeste Fideles) - O Little Town Of Bethlehem - The First Noel - We Wish You A Merry Christmas - What Child Is This? Two-channel audio of each of the songs allows you to play along with either part, or hear both together. Rehearse or perform duets anytime, anywhere! This great series comes with a CD that features separate tracks for the Primo and Secondo parts, and is enhanced so Mac & PC users can adjust the tempo without changing pitch! 10 songs: Blue Christmas · The Chipmunk Song · The Christmas Song · Christmas Time Is Here · I'll Be Home for Christmas · It's Beginning to Look like Christmas · Mistletoe and Holly · Rockin' Around the Christmas Tree · Rudolph the Red-Nosed Reindeer · Silver Bells. Perfect for church or studio, these four delightful medleys incorporate 13 Christmas classics, including: Angels We Have Heard on High · Deck the Hall · First Noel, The · Go, Tell It on the Mountain · The Holly and the Ivy · Joy to the World · O Christmas Tree · Silent Night · We Wish You a Merry Christmas · and more. 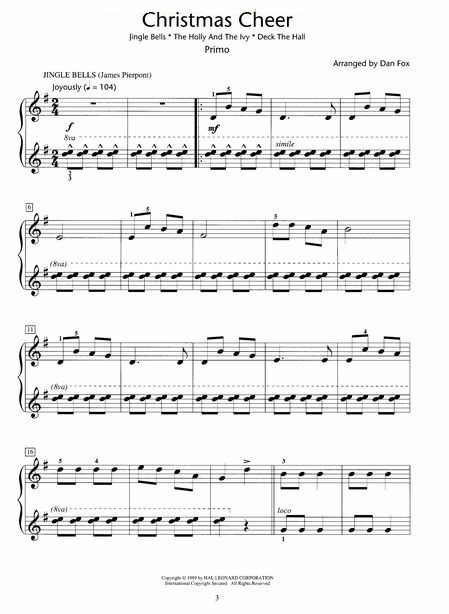 Accompaniment tracks to the corresponding book from the Hal Leonard Student Piano Libary. Accompaniment tracks on a General MIDI disk for the corresponding book from the Hal Leonard Student Piano Libary. Four-part student ensembles,expertly arranged for two or more pianos by Phillip Keveren. 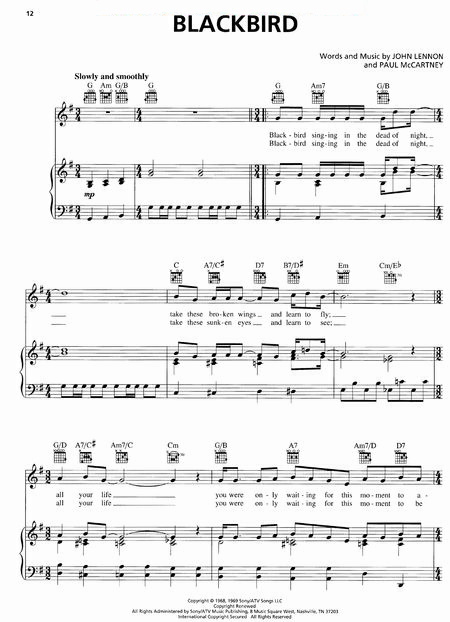 These ensembles feature favorite Christmas carols and hymns in graded books that correspond directly to the HLSPL Piano Method levels. CD and General MIDI disk accompaniments are available for all levels. 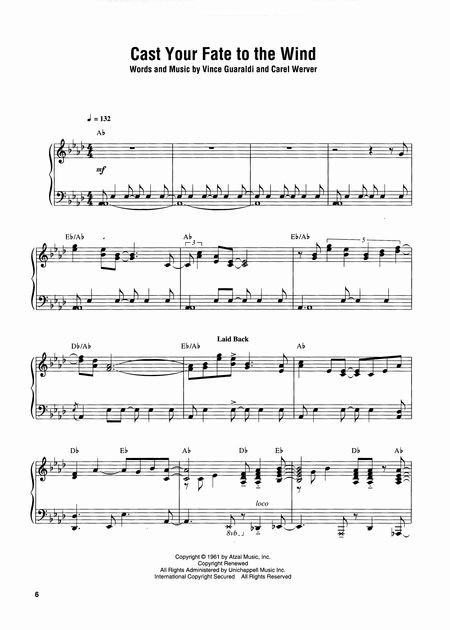 Each book in the Christmas Piano Ensembles series includes: four individual student parts for each song on perforated,tear-out sheets (Performance requires purchase of only one book per ensemble team); a conductor's score with optional teacher accompaniment; performance configurations for 2 or more pianos; and suggested instrumentation for digital keyboard. Level 1 includes: Good King Wenceslas · Jingle Bells · Jolly Old St. Nicholas · We Three Kings of Orient Are. 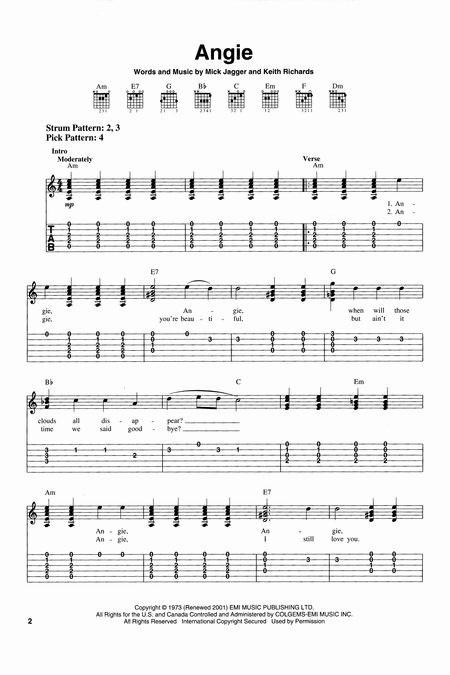 Four-part student ensembles,arranged for two or more pianos by Phillip Keveren. These ensembles feature favorite Christmas carols and hymns in graded books that correspond directly to the HLSPL Piano Method levels. CD and GM disk accompaniments are available for all levels. 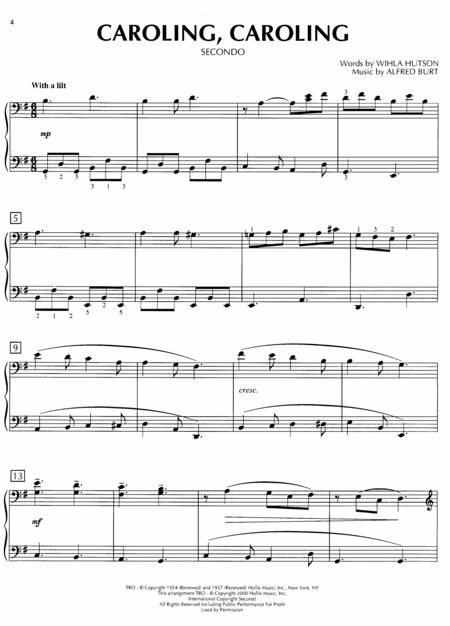 Each book in the Christmas Piano Ensembles series includes: 4 individual student parts for each song on perforated,tear-out sheets (Performance requires purchase of only one book per ensemble team); A conductor's score with optional teacher accompaniment; Performance configurations for 2 or more pianos; Suggested instrumentation for digital keyboard. Level 2 includes: I Saw Three Ships · O Come,All Ye Faithful (Adeste Fideles) · Up on the Housetop · What Child Is This?. Four-part student ensembles,arranged for two or more pianos by Phillip Keveren. 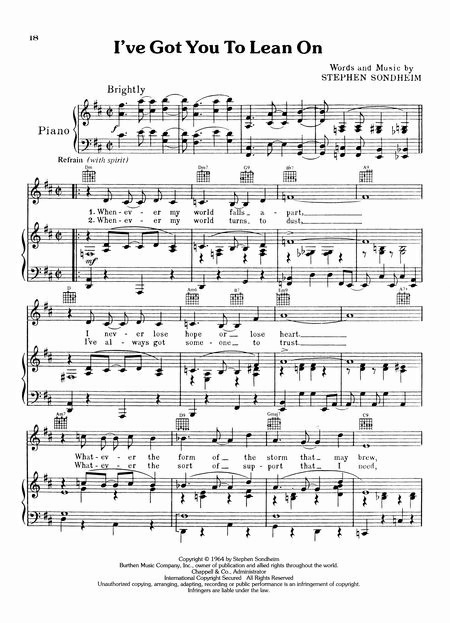 These ensembles feature favorite Christmas carols and hymns in graded books that correspond directly to the HLSPL Piano Method levels. CD and GM disk accompaniments are available for all levels. 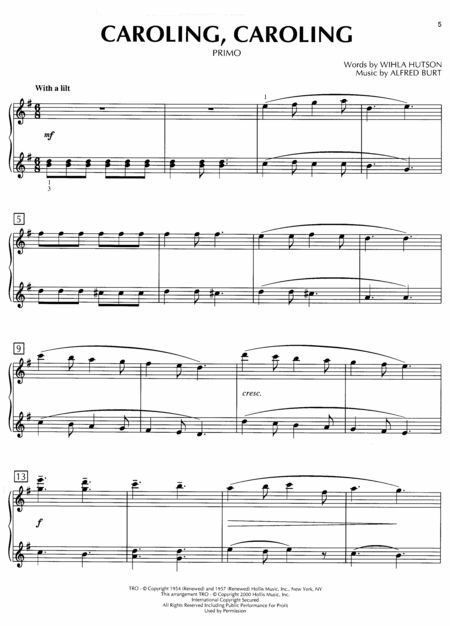 Each book in the Christmas Piano Ensembles series includes: 4 individual student parts for each song on perforated,tear-out sheets (Performance requires purchase of only one book per ensemble team); A conductor's score with optional teacher accompaniment; Performance configurations for 2 or more pianos; Suggested instrumentation for digital keyboard. Level 3 includes: Carol of the Bells · Rockin' Around the Christmas Tree · Rudolph the Red-Nosed Reindeer · We Wish You a Merry Christmas. Four-part student ensembles,expertly arranged for two or more pianos by Phillip Keveren. 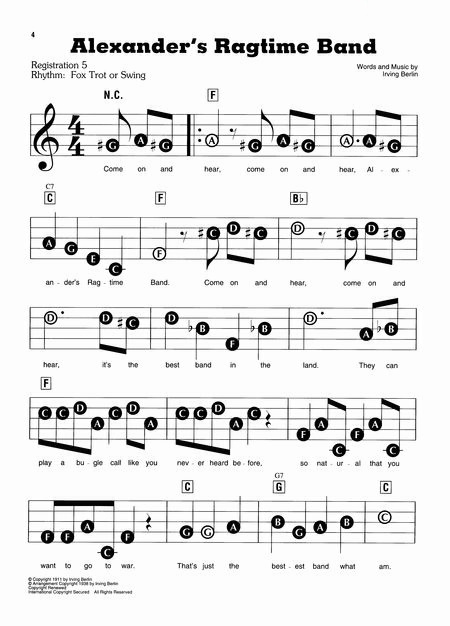 These ensembles feature favorite Christmas carols and hymns in graded books that correspond directly to the HLSPL Piano Method levels. CD and General MIDI disk accompaniments are available for all levels. 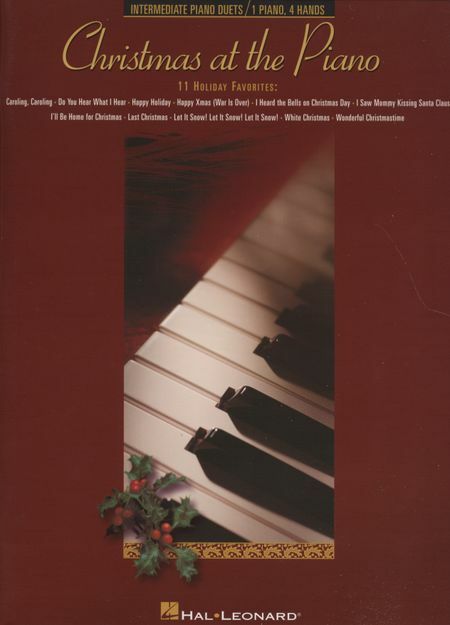 Each book in the Christmas Piano Ensembles series includes: four individual student parts for each song on perforated,tear-out sheets (Performance requires purchase of only one book per ensemble team); a conductor's score with optional teacher accompaniment; performance configurations for 2 or more pianos; and suggested instrumentation for digital keyboard. Level 4 includes: Angels We Have Heard on High · Jingle-Bell Rock · Parade of the Wooden Soldiers · Silver Bells. 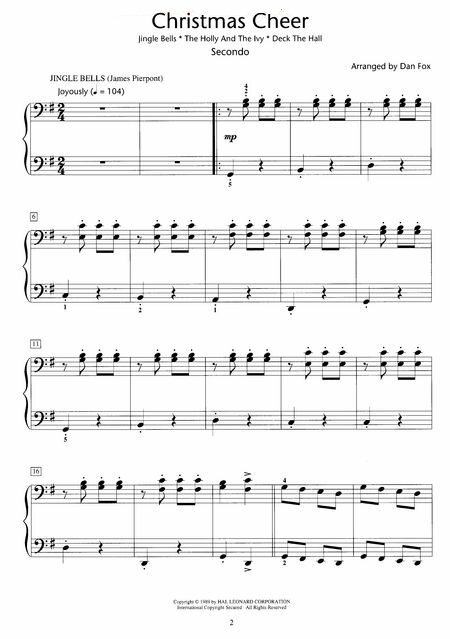 Four-part student ensembles, expertly arranged for two or more pianos. 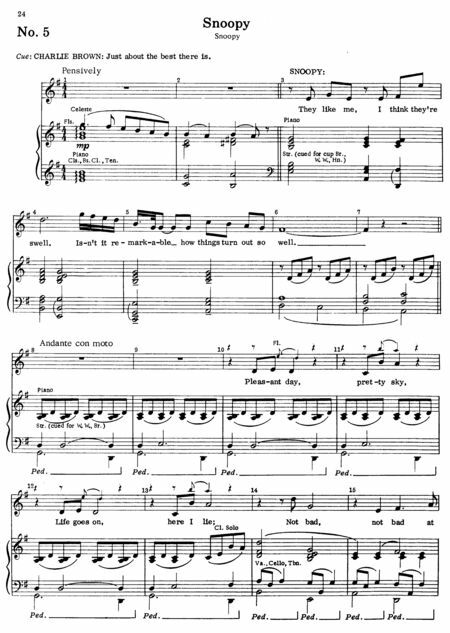 These ensembles feature favorite Christmas carols and hymns in graded books that correspond directly to the HLSPL Piano Method levels. Angels We Have Heard on High · Jingle-Bell Rock · Parade of the Wooden Soldiers · Silver Bells. Four-part student ensembles,expertly arranged for two or more pianos. 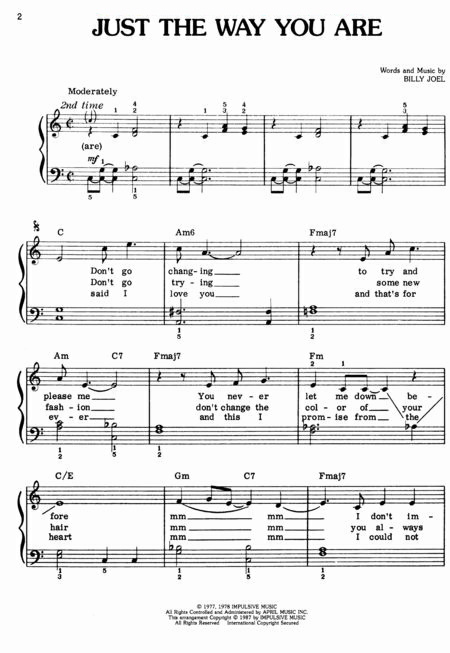 These ensembles feature favorite Christmas carols and hymns in graded books that correspond directly to the HLSPL Piano Method levels. This volume includes: Angels We Have Heard on High · Jingle-Bell Rock · Parade of the Wooden Soldiers · Silver Bells. Four-part student ensembles,expertly arranged for two or more pianos by Phillip Keveren. 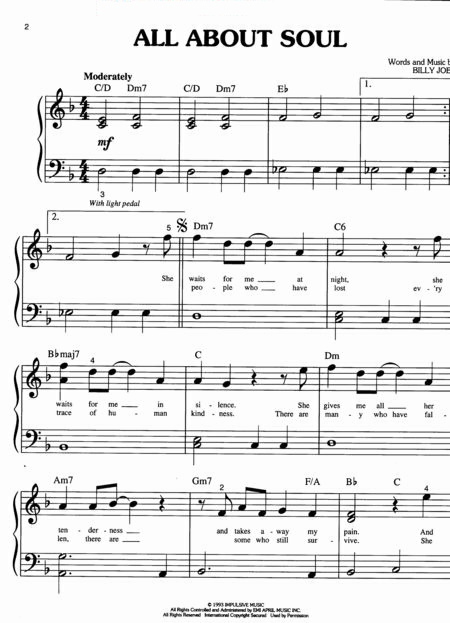 These ensembles feature favorite Christmas carols and hymns in graded books that correspond directly to the HLSPL Piano Method levels. CD and General MIDI disk accompaniments are available for all levels. 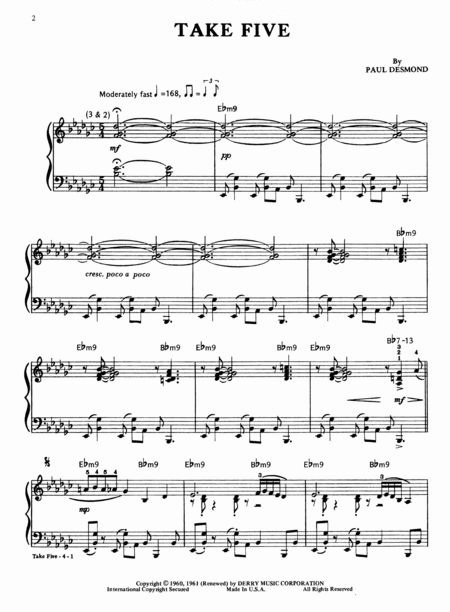 Each book in the Christmas Piano Ensembles series includes: four individual student parts for each song on perforated,tear-out sheets (Performance requires purchase of only one book per ensemble team); a conductor's score with optional teacher accompaniment; performance configurations for 2 or more pianos; and suggested instrumentation for digital keyboard. Level 5 includes: Jingle Bells · Let It Snow! Let It Snow! Let It Snow! · March from The Nutcracker · Mister Santa.